A wedding anniversary is not just a celebration of your special day, it is also a celebration of your love standing the test of time. 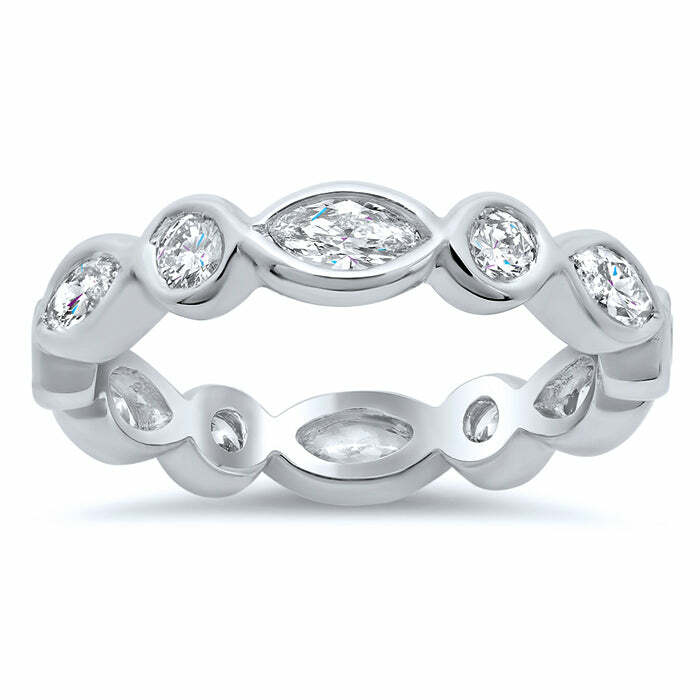 deBebians carries a large collection of eternity bands that would be a wonderful surprise for your beloved. The diamonds and/or gemstones go the entire way around the ring, which symbolizes your continuous love and devotion. I have made a list of some of my personal favorite eternity bands that can be given simply as an anniversary gift or as an upgrade from a simpler wedding band. This eternity ring features bezel set alternating diamonds and marquise cut diamonds. The 4mm width means that this ring has presence while not being overly showy. It will pair nicely next to an engagement ring or other eternity bands in a unique stack. 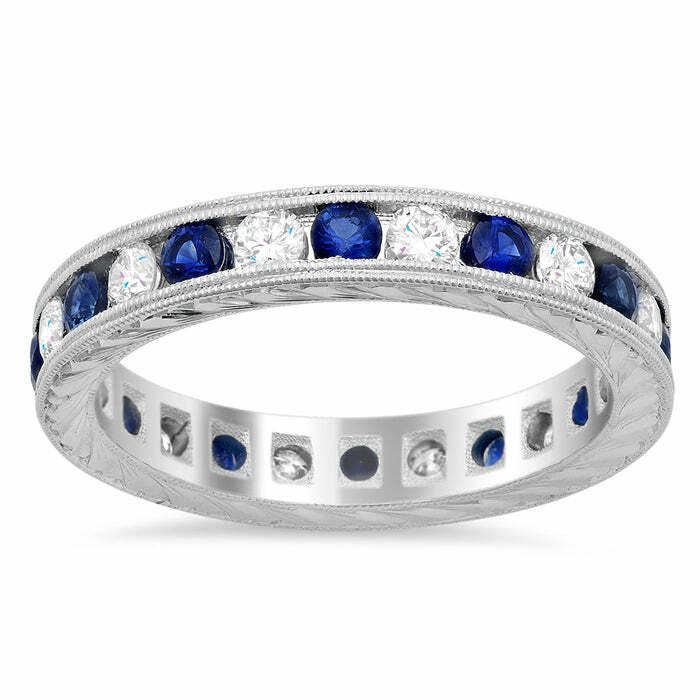 This channel set eternity ring features both sparkling white diamonds and blue sapphires. If you and your partner were married in September, this would be a lovely representation of your wedding month. The double milgrain and decorative hand engraving complete the look. There is no gift more romantic than an eternity band that features fancy pink diamonds. 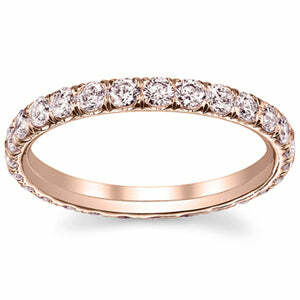 If paired with rose gold, the rosy color of the setting will enhance the hue of the pink diamonds. The u pave setting displays the pink diamonds in an elegant and unforgettable way. For an ultimate show piece, this radiant diamond eternity band is an absolute stunner. The total carat weight of the ring is approximately 8.00 cttw, which means each fancy yellow diamond will weigh an estimated 0.53 ct each. 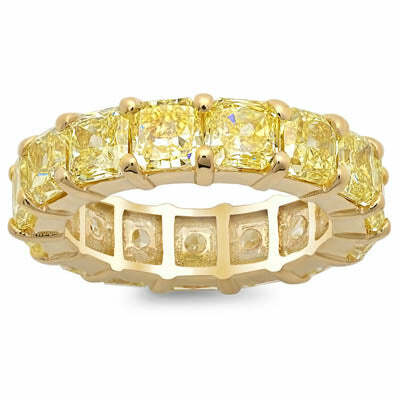 This ring is created with luxurious 18 karat yellow gold, which maximizes the color of the stones.